From our friends at Foil Vedanta. Declare solidarity with grassroots movements fighting Vedanta in India, Africa and elsewhere! 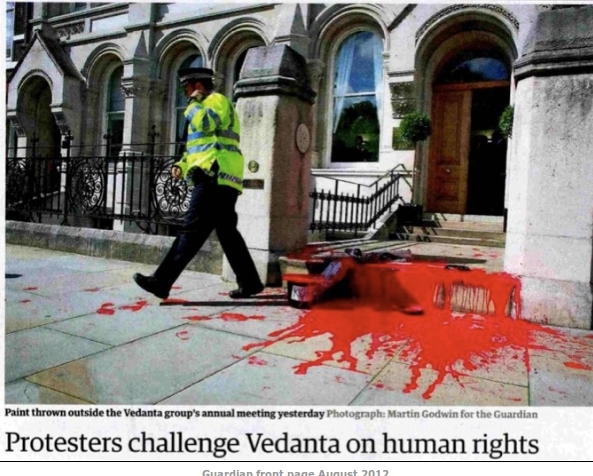 Kick Vedanta out of London for it’s corporate crimes, murder and destruction. Noise demonstration and picket at Vedanta headquarters, 16 Berkeley Street. Mayfair, W1J 8DZ . Green Park tube. 1 – 3pm. Friday 11th January. On Friday 11th January the Supreme Court will finally announce its historical decision on whether to allow the mining of the threatened Niyamgiri mountain in Odisha, India1. Simultaneously tribals and farmers from a number of grassroots organisations2 will hold a rally of defiance in Bhawanipatna, near the mountain. They will call for closure of the sinking Lanjigarh refinery and an absolute ban on the so-far-unsuccessful attempt to mine bauxite on their sacred hills3. On 10th of January activists in New York will rally outside the United Nations Headquarters pointing out Vedanta’s clear violations of the UN Declaration on the Rights of Indigenous Peoples, including right to participate in decision making, right to water and cultural and religious rights. They will call for the Indian Government to put a final stop to this contested project, and for the state owned Orissa Mining Corporation to be pulled out of dodgy deals it has made with Vedanta in an attempt to force the mine through the courts on Vedanta’s behalf (see their facebook event). Here in London we will draw attention to Vedanta’s nominal Mayfair headquarters from which they gain a cloak of respectability and easy access to capital. We will call for Vedanta to be de-listed from the London Stock Exchange and thrown out of its cosy position in the London corporate elite for proven human rights and environmental abuses, corruption and poor corporate governance4. Please join us and bring drums, pots and pans and anything that makes noise! Our solidarity demo on 6th Dec was covered in all the Indian papers and our solidarity was felt directly. Let us do it again! See you there! More information below. (1) The Supreme Court is due to make a final decision on the challenge posed to the Environment Ministry’s stop to the Niyamgiri mine on 11th January. In its December 6th hearing the Supreme Court concluded that the case rested on whether the rights of the indigenous Dongia Kond’s – who live exclusively on that mountain – could be considered ‘inalienable or compensatory’. The previous ruling by Environment and Forests minister Jairam Ramesh in August 2010 prevented Vedanta from mining the mountain due to violations of environment and forestry acts. The challenge to this ruling has been mounted by the Orissa Mining Corporation, a state owned company with 24% shares in the joint venture to mine Niyamgiri with Vedanta, begging questions about why a state company is lobbying so hard for a British mining company in whom it has only minority shares in this small project (see Niyamgiri: A temporary reprieve). 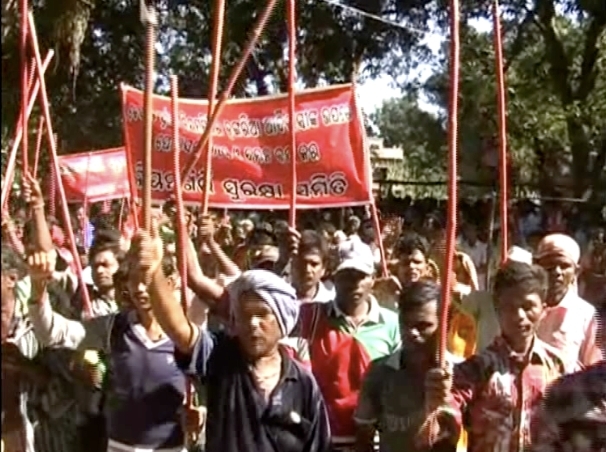 On 6th December, in anticipation of a final Supreme Court ruling, more than 5000 tribals and farmers rallied on the Niyamgiri mountain and around the Lanjigarh refinery sending a message that they would not tolerate the mine or the refinery. In London Foil Vedanta held a noise demo outside the Indian High Commission in which a pile of mud was dumped in the entrance. This news was carried all over India by major papers and TV and had a significant impact (see London protesters join 5000 in India to stop mine). (2) Niyamgiri Surakhya Samiti, Sachetana Nagarika Mancha, Loka Sangram Mancha, Communist Party of India and Samajwadi Jan Parishad will coordinate the rally in Odisha on the 11th Jan.
“A London listing allows access to an enormous pool of capital. If you are in the FTSE Index, tracker funds have got to own you and others will follow.” Both Vedanta Resources and Essar Energy are members of the FTSE 100. London’s reputation as a market with high standards of transparency and corporate governance is another draw for Indian companies. Both Vedanta and Essar have faced criticism on corporate governance grounds in India, and a foreign listing is seen as one way to signal to investors that the company does maintain high standards. We are joining the calls of parliamentarians and financiers in pointing out how the London listing is used for legal immunity and to hide Vedanta’s corporate crimes. We are calling for Vedanta to be de-listed from the London Stock Exchange and taken to court for Human Rights abuses here in London.